(Guitar Solo). 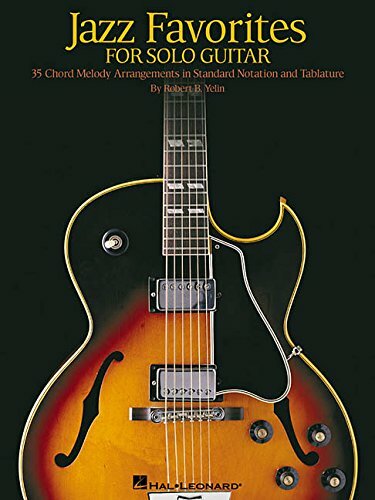 This fantastic jazz guitar collection includes Robert Yelin's lush chord melody arrangements in standard notation and tab for 35 favorites: Angel Eyes * Autumn in New York * Body and Soul * Call Me Irresponsible * Fly Me to the Moon * Honeysuckle Rose * How Deep Is the Ocean * I Could Write a Book * I'll Remember April * The Lady Is a Tramp * Lush Life * Midnight Sun * Mood Indigo * My One and Only Love * My Shining Hour * Nature Boy * Polka Dots and Moonbeams * Skylark * Solitude * Speak Low * Take the "A" Train * There Is No Greater Love * Where or When * Witchcraft * and more. Robert, B. Yelin; Yelin, Robert B.